Dubspot Instructor and Native Instruments Product Specialist Matt Cellitti takes a first look at some of the outstanding new features in Komplete 8 and Komplete 8 Ultimate: Two brand new products that include up to 50 products and a hard drive with 240 GB full of content! This marks one of the most exciting releases ever for Native Instruments, with the announcement of both Komplete 8 and Komplete 8 Ultimate. Never before has there been so much value included in a Komplete bundle. I’m almost a little jealous to think how exciting it will be for a brand new Komplete user to jump right into Komplete 8 Ultimate and explore a whole new world of sounds that they have never before heard. The big distinction here is the introduction of Komplete 8 Ultimate. For the first time ever, Native Instruments is offering up just about every single product in one gigantic, 240GB bundle. Now you might be asking, “How the @#$^ am I going to load 240GB worth of content from DVDs onto my computer?! ?” No worries. There is a sturdy USB 2.0 hard drive included with all of the content that will install onto your computer in about half the time that you spent trying to load up Komplete 7, no more popping in DVDs and anxiously awaiting for hours to play with your new toys. It is worth noting here that this drive is not writeable, the hard drive is here to expedite the installation process and make it more manageable to get the content into your computer. It does not stream content, nor can you add to it. The beauty here is that you will never have to sit through a crazy-long install process ever again! If you examine the value here, it is pretty obvious that Komplete 8 Ultimate is the way to go for anyone looking for a deal. You get 50 amazing tools at your disposal, including several brand new additions (Studio Drummer, Transient Master, Retro Machines MK2, Kontakt 5, Guitar Rig 5, Solid Mix Series) all for well over 80% off the original purchase price! 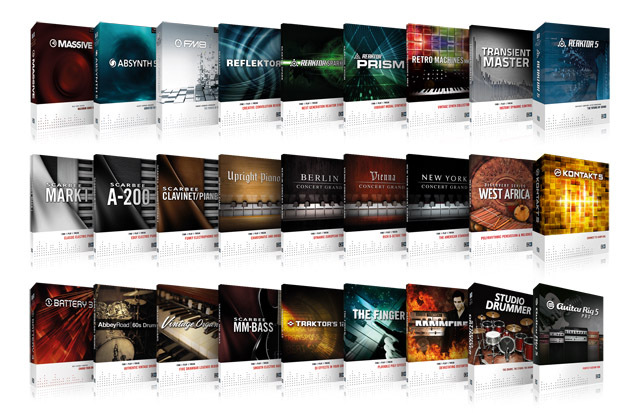 Customers who decide to opt for the less expensive Komplete 8 bundle will still get fantastic value, but you are missing out on huge fan favorites like Razor, The Mouth, Session Strings Pro, Alicia’s Keys, and George Duke Soul Treasures. If you ask me, the only way to go is Ultimate. It is still cheaper than most LE versions of a hardware workstation and will absolutely knock the socks off those things. I can’t begin to tell you how exciting the new version of Kontakt 5 will be. A lot of the “guts” and “under the hood” stuff in Kontakt has been reworked, including the fact that there are an amazing amount of new filters to enjoy. Sound Designers and filter freaks should rejoice because we are talking about 37 new, high quality filters to work with now. These sound great and are replacing old filters that were born out of Kontakt 2 many years ago. Very exciting! The brand new Studio Drummer instrument for Kontakt takes advantage of newfound power in Kontakt 5. Here is another phenomenal value for musicians looking to create realistic drum tracks in their production. 3 drum kits, meticulously sampled, and then ran through top of the line signal chains to give you some of the best recorded drums available. From there, you can pick from over 3,500 grooves to use in your compositions or create your own MIDI arrangement. Lastly, put the finishing touches on in the “studio environment” where you can add the new Solid Mix effects, which mimic a classic recording console (can you tell which one?) or the Transient Master to shape your kick and snares just right. Having a product like Studio Drummer really adds another dimension to Komplete as it helps round out the offerings included, truly making it more Kompleterer. Also included in Kontakt 5 is the new Retro Machines MK2 collection for all the analog goodness you crave. Old ARPs, Crumars, Korgs, Moogs, and Rolands give you an eclectic mix of phat analog sound without the hassle of dealing with these quirky instruments. Kore 2 users will love the addition of the sound variations to easily blend through extreme variations of a particular sound. You’ll be making epic Bladerunner-esque soundtracks and classic 80’s-style synth pop in no time. Guitar Rig 5 has some very nice additions as well. Two new amplifiers, the “Van 51” which is basically a Peavey 5150 that Eddie Van Halen uses and the “Hot Solo +” which looks to resemble a Soldano custom amp, are both welcome additions to the heavier tones in GR5. It is no small feat to be able to pull off realistic sounding high-gain distortion in amp modeling software, and these new models sound unbelievable. Couple this with the new Control Room Pro, which allows you to customize up to 8 different signal chains (amp, mic, mic placement) at once, and you have more control over your guitar sound than ever. There are 6 new effects total that will work great for both guitars and production effects. Remember not to sleep on Guitar Rig if you aren’t a guitar player. This is one of the most amazing effect units for your synths, vocals, drums, etc. I am most excited about the addition of Resochord here and the Container effects. If you have ever had the joy to use the Resochord effect in Maschine or Reaktor, then you might have an idea of how crazy this can make your guitar sound. Then you can take it up another notch by adding multiple effects inside of the new Container module. This effect is like a housing unit for whatever crazy multi-effects and custom effect chains you can think up. Put a ton of effects in, assign all sorts of knobs to the 8 macro controls and tweak until the cows come home! Hmm, I think Maschine has 8 knobs on it that would be perfectly suited to work with this new knob-tweaking masterpiece. And last but certainly not least, if you are as crazy about Maschine as I am, then Komplete 8 is even more intriguing now that you will be able to load up all of the Komplete sounds from Maschine’s browser with the upcoming 1.7 free update. Browse through tens of thousands of sounds right from the Maschine controller so you can instantly find the exact type of patch you are looking for. Did you want a FAT, DISTORTED, ECHOING, ANALOG Synth Lead and don’t care what instrument will deliver these qualities? Find one in seconds without ever stopping your beat and never touching the mouse. This combination of Maschine and Komplete has to be recognized as one of the strongest duos in today’s music production landscape with its unmatched sound quality and hands-on approach to production. Overall, this is an absolutely stellar offering from Native Instruments. 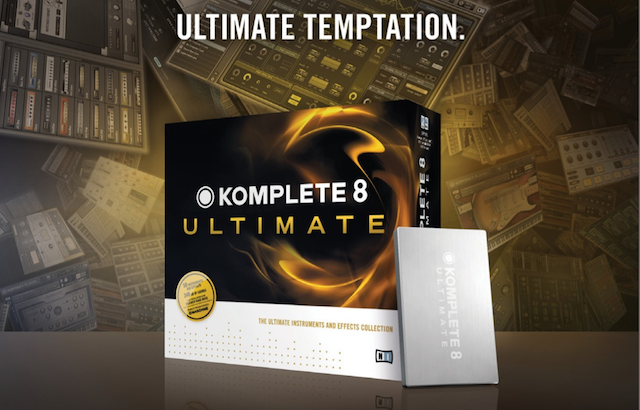 If you have never jumped into the world of Komplete, you would be crazy not to start here with Komplete 8 Ultimate. If you are already an NI user, well then there are plenty of update/upgrade paths for all of you. Written by Dubspot instructor and Native Instruments product specialist Matt Cellitti. For further exploration of Komplete 8 and Komplete 8 Ultimate, be sure to check out Dubspot’s Sound Design & Synthesis Certificate Program with Native Instruments Komplete. Become fluent in the language of sound design and synthesis with this six-level program that uses NI’s Komplete 7 as a platform for learning synthesis and sampling techniques. Starting with an introduction to the properties of sound, this comprehensive series of courses covers most common synthesis methods available for music production in the DAW of your choice. Nice..looking forward to run Transient Masters in Maschine ! It’s a incredible site all regarding their sound, studio and recording techniques is there … I was so surprised myself and my band. I would definitely recommend these guys.